Trend Micro Internet Security 2008 (TIS version 16) which previously and famously known as PC-Cilin is a relatively new release of Internet security suite product in March 2008, although the latest Trend Micro Internet Security 2009 v17 has been released. However, TIS or TMIS 2008 is still good and powerful enough to protect users against viruses, spyware, identity theft, spam, unwanted changes to operating system and critical software, wireless home network intrusion, and other security threats, especially when it’s free. HTC Internet is providing its residential customers free Trend Micro Internet Security Suite 2008 subscription license, which costs $49.95 value annually. Best of all, the serial number given away will activate and unlock Trend Micro PC-cilin Internet Security Suite 2008 as full version and fully licensed product for 3 years. The license is valid until September 29, 2011 expiry date, and users are entield to free virus definition and signature update. To get the free serial number for TM Internet Security 2008, visit http://www.sccoast.net/tools/internetsecurity/download.php, the portal site for HTC Internet, to get the 2008 Trend Micro PC-cillin Internet Security Reg Serial Number, which is PFEP-9991-7436-4997-1545. 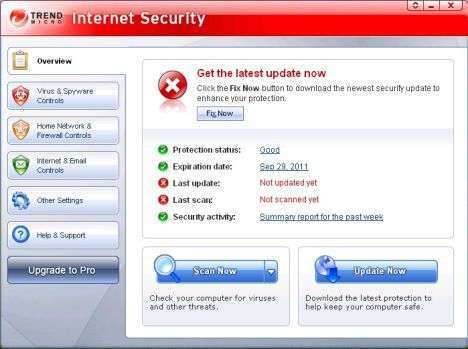 Then visit http://www.trendmicro.com/download/product.asp?productid=32, Trend Micro Internet Security [PC-cillin] Previous Versions download page to download the setup installer for TIS 2008 (direct download link to 32-bit TIS 2008 version 16.1: TrendMicro_TIS_16.1_1063_x32.exe or 64-bit TIS 2008 version 16.1: TrendMicro_TIS_16.1_1063_x64.exe). Note: Uninstall any existing Trend Micro or other security software before installing the 2008 version. 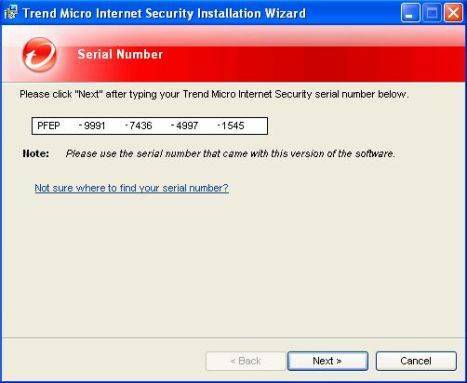 During installation of Trend Micro Internet Security 2008, enter the product key when prompted. With the free product key, user can activate the installed Trend Micro Internet Security without any crack or keygen (key generator) or go to warez sites to search for hack, users will be getting 3 years free usage of TIS 2008 till September 2011.